Memorial Day is right around the corner, and we’re celebrating the holiday the best way we know how — with brunch! Below, we’ve rounded up some of our favorite restaurants that offer weekday brunch so you can end your long weekend with mimosas and delicious brunch dishes. Jack’s Wife Freda is a staple in the NYC brunch scene, serving up Mediterranean-inspired dishes in a quaint, cafe-life space. Grab a seat on the patio and spend your morning people watching while enjoying light-but-filling brunch dishes you won’t feel guilty about indulging in afterward. Our favorite menu items include the Mediterranean breakfast, the poached eggs with roasted tomatoes and halloumi cheese, and the green shakshuka. Read our review of Jack’s Wife Freda here. 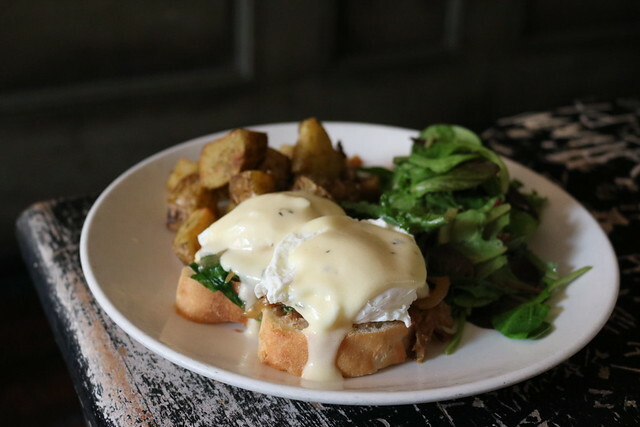 Jack’s Wife Freda serves brunch every day beginning at 8:30 a.m. 224 Lafayette St. Since Memorial Day is the unofficial start of summer, it only seems natural to have your holiday brunch outside. We recently brunched at Rabbithole in Williamsburg and fell in love with the restaurant’s casual outdoor patio. Start with some pastries before moving on to the can’t miss entrees like the eggs Florentine and the vegetarian omelette filled with roasted tomato, caramelized onion, and goat cheese. Read our review of brunch at Rabbithole here. Rabbithole serves brunch every day beginning at 9 a.m. 352 Bedford Ave., Brooklyn. 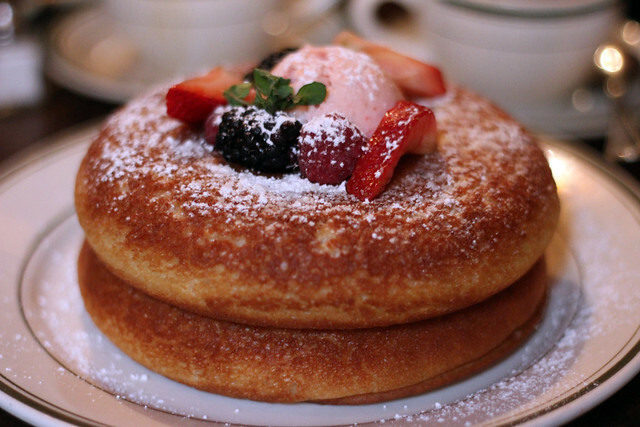 If you’re not worried about your carb intake and want to experience brunch with pancakes that NYC editor-in-chief Becca has described as “the best of her life,” head to Le Barricou this Memorial Day. The charming French bistro has a rustic-chic vibe and serves up affordable, country-style fare. In addition to the aforementioned pancakes, which are topped with berries, strawberry butter, and pure maple syrup, we recommend the merguez and eggs and the Le Barricou salad. 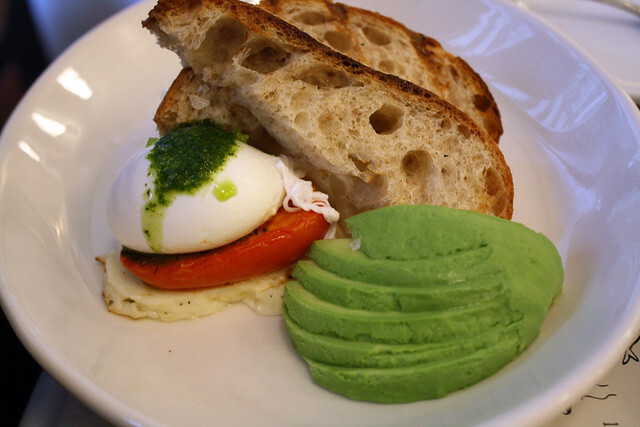 Read our review of brunch at Le Barricou here. Le Barricou serves brunch on Saturdays and Sundays from 10 am. to 4 p.m. and on weekdays from 11 a.m. to 4 pm. 533 Grand St., Brooklyn. Swimsuit season is upon us, which means it’s time to start exploring some healthier brunch options so we look our best at the beach. The extensive beverage menu – which features a slew of coffees, teas, smoothies, and fresh juices – is reason enough to check out Two Hands, but the food is just as impressive too. 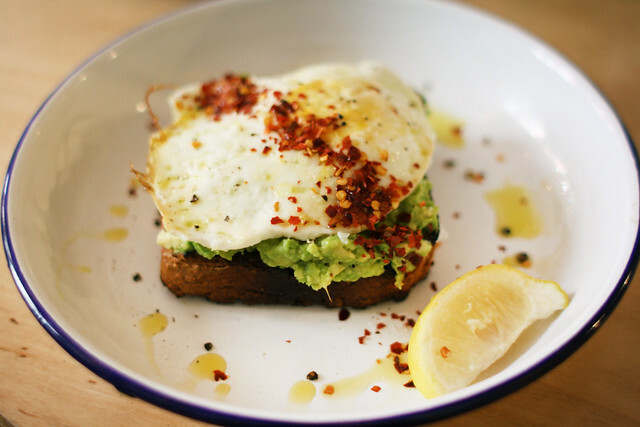 We suggest ordering one of the breakfast bowls, and you definitely won’t want to miss out on the avocado toast. Read our review of Two Hands’ brunch here. Two Hands serves brunch every day from 8 a.m. to 5 p.m. 164 Mott St.
Because no holiday brunch is complete without an unlimited supply of mimosas, we had to include Mezetto in our Memorial Day guide this year. The Mediterranean spot, which offers a $17 bottomless mimosa deal, features authentic ethnic decor and an open-air setup, which makes it feel like you’re sitting outside. 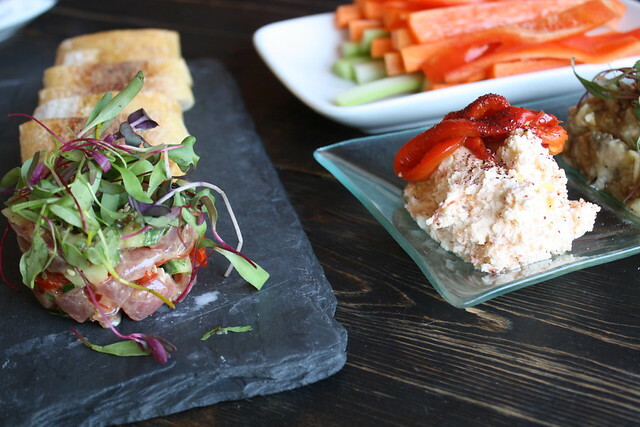 Mezetto’s brunch menu has a slew of tapas-style dishes that are perfect for sharing, so this spot is ideal if you want to dine with a few friends and sample a bunch of different items. Start with the trio of spreads, and don’t forget an order (or two!) of the falafel buns. Read our review of Mezetto’s brunch here. Mezetto serves brunch daily at 10 a.m. 161 E. Houston St.
There’s no better way to spend Memorial Day than with a pitcher of sangria and a group of your best friends, which makes Yuca Bar a solid selection for your upcoming holiday brunch. This lively Alphabet City hotspot has seriously strong sangria and other brunch cocktails, as well as tasty Latin food — like arepas benedictos and churrasco and eggs — to soak up all the booze. Yuca Bar serves brunch on Saturday and Sunday from 11 a.m. to 4:30 p.m. and from 11 a.m. to 5 p.m. on Memorial Day. 111 Avenue A.